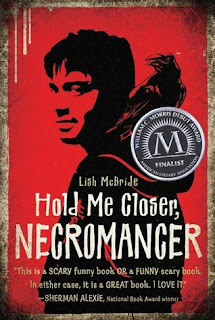 My October creepy book marathon continues with Hold Me Closer, Necromancer by Lish McBride. This had been sitting on my TBR list for quite a while, but it fit so well with my theme that I just had to give it a go. And so we meet Sam LaCroix, your basic slacker extraordinaire with a heart of gold. He works at a local fast food joint called Plumpy’s with his best friends in the world: his buddies-since-the-playground Ramon, timid but enthusiastic Frank, and Brooke who’s sugar on the outside but all sass when she opens her mouth. During a break, Brooke & Sam play a game of potato hockey and bust out a taillight on a Classic Shiny Car in the parking lot. Oddly enough, this action starts a series of unexplained craziness that leads to a world of witchcraft, raising the dead, ghostly portals, a seriously powerful and feisty were-fey-shifter-girl, zombie pandas, and a decapitated head in a bowling bag. Everything Sam knows is about to change in just about every single way. If you’re looking for a complete and total scare-fest, this isn’t where I would head. I enjoyed the story very much, and it definitely has its moments, but this isn’t horror. It actually reads like a cross between paranormal and contemporary (contemparanormalary? Eh? No? ), and that suits me just fine. It has more than enough monsters and mayhem to entice a paranormal crowd while keeping itself grounded in the present day. Much of that comes from Sam himself. He’s fairly easygoing, considering he doesn’t completely lose his mind when he learns he has the ability to wake the dead, and he seems like the kind of guy I would have as a friend. I mean, he listens to Alkaline Trio, which I think says more about his character than anything else. It’s so evident that he genuinely cares for his family and his friends, so it’s a comfort to him to know that they will fight for him, even when the enemy is the evilest of evil dudes. Sam’s supporting cast is a set of capital-c Characters that could easily distract from the story, but they never do. Brooke and Brid are stand-outs—I also think it says a lot about Sam that he attracts the attention of lots of strong-willed and awesome ladies. My favorite is Sam’s elderly neighbor Mrs. W., who provides one of my favorite twists in the whole tale. My one and only peeve about it is the changing viewpoints. We start with Sam in first person, but it jumps around to other characters’ views, and those are in third person. It’s an interesting way to show other sides of the story--especially the bad guy--but I thought it slowed the pacing down too much, and it took me away from a voice that called for my attention. Once you get a better grasp of the characters (and once the focus centers primarily back on Sam), I couldn’t turn the pages fast enough. I thought Hold Me Closer, Necromancer was a great story that took a bit to grow on me. Hopefully, this will bring out more contemparanormalary (it’s gonna be a thing) for me to read in the future. I just recently bought this book, purely because of the title lol. (what can I say necromancy catches my interest) Great review! I like the sound of the whole contemparanormalary sounds like a fabulous concept! It's totally gonna be a thing, right?